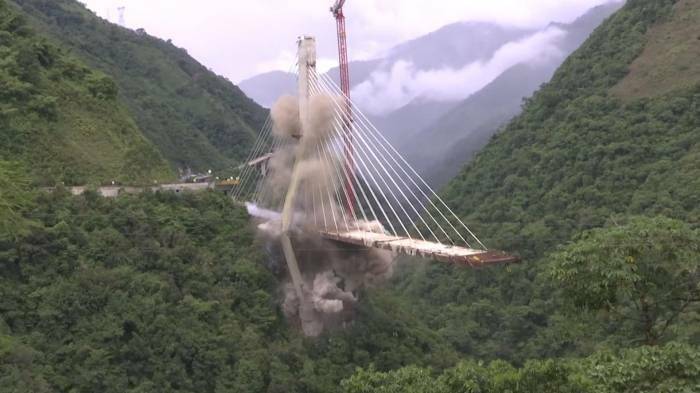 This is the moment an unfinished bridge in Colombia was demolished. The construction, located in the Chirajara canyon, was destroyed using a controlled explosion. Officials took the decision to halt work on the bridge after 10 construction workers were killed when it partially collapsed in January. They had been working on drainage along the structure at the time. A report said the collapse was the result of faults in the design and the demolition of the remaining part was taken as a security measure. The unfinished bridge, located in Chirajara on the border of Cundinamarca and Meta provinces, was to be part of the highway that connects the capital Bogota and the city of Villavicencio. Had it been completed, it would have spanned 446 metres over the canyon, which is 286 metres deep. Demolition experts used 100kg of plastic explosives and 30 detonation devices to cause the massive implosion.